Bishop Greg Anderson’s Charge to the Synod of the Diocese, Friday May 5th, 2017. Welcome to the 34th Synod of the Diocese of the Northern Territory. It is a great opportunity for us to meet as representatives from Anglican churches across the Territory, with all of our geographical, social, language and cultural differences, yet fundamentally united as brothers and sisters, because in Christ God has rescued us and brought us into one family. Synod in the Northern Territory is a much more complicated matter than in some other parts of the Anglican Church of Australia. Many people have to travel long distances to be here. We have challenges of accommodation. We have challenges of communication. We have challenges of providing food. I am very grateful to all those who have put in an enormous effort into preparing for this synod. In particular, our Registrar, Leeanne Zamagias, has spent many weeks in gathering and putting together the synod papers and in organising logistics, assisted by Jai Chandler in the diocesan office. Our Ministry Development Officer, Kate Beer, as well as being involved in organising logistics for synod, has worked hard with Keith Joseph and Bruce Chapman on the new Professional Standards Ordinance which will be considering tomorrow. Kate has also organised and led the pre-synod training workshop for Aboriginal synod representatives from the Arnhem Land parishes, hard on the heels of Katherine Christian Convention. The Ministry Development Team members, Tavis Beer, Ruth Brigden, Bruce Chapman, Liz McCoy and Terry McCoy, also contributed to that workshop. Our Chancellor Max Horton has worked hard as usual to keep us on the correct legal track and our new Deputy Chancellor Mark Fowler has cast an eye over some legal issues as well. We have also to thank the many people who are helping or will help the synod to run smoothly – the cathedral for providing a place and food for us tonight, St Peter’s Nightcliff for hosting our venue tomorrow and Sunday, and St James’, Sanderson for providing food for us for tomorrow and Sunday; various transport providers; those who contributed to our opening service (including the musicians, readers and those who presented items), and Kormilda College and Nungalinya College for accommodating synod representatives who were here for the pre-synod workshop as well as synod. Diocesan Council also puts significant work into the processes that lead up to Synod, and I am grateful to them for their work not just in that way, but for the whole two years since our last synod. I am grateful too to those who have thought hard and responded to various matters in our synod papers; having that kind of work done beforehand can mean that our business at synod moves forward more efficiently. In fact, I want to say thank you to all of you for being here. I recognise that to give up a weekend, or longer for those who came to the pre-synod workshop, and those who have travelled a long way, is a significant burden on your time and relationships. I said last synod that as Anglicans, we believe clergy and lay Christians should hear from each other as we make decisions together, regarding the life of our diocese and the churches that it serves. You being here shows that we belong together, in spite of our diversities. At our synod opening service earlier this evening, I emphasised the theme of unity. Jesus prayed before he went to the cross that his disciples would be one. He also prayed the same thing for those who would believe in him because of the disciples’ message. We read in Hebrews 7:25 that Jesus always lives to pray for us. He is praying still that we will be one. Being one is easy if we all agree. I expect that there will be many matters that we agree about in this synod. But at synods we can also expect some disagreement. Maybe that makes it harder to show that we are one. I saw an interesting exchange on Facebook recently about the issue of abortion, in the context of the Greens bringing a bill to the NSW parliament. The Facebook discussion was about what we might call the ‘content’ of the issue – what the principles behind certain political decisions were, but it also mentioned the way we Christians can best discuss this very difficult and personal matter. There are other matters apart from this one that we might have different ideas about in our synod. But what would what Dickson calls a “grown-up conversation” look like for any of them? Or better still, what would a conversation that demonstrates our oneness as Christians look like? I trust that in our debates, we can listen respectfully to ideas we disagree with, believing that they are being expressed by people who have thought carefully about them from a Christian point of view, and who want what is best for God’s work in this diocese. Dickson’s friend adds that an adult conversation will require people to have an open mind. This might be a lot to hope for, but I am hopeful that it is possible that as people speak in debate at synod, we might hear something we had not considered before, and that this might lead us to reflect further and even change our original thinking. At the same time, as Anglicans, we are not simply trying to come up with a human consensus, but to understand God’s view, which is revealed to us in what the 39 Articles call ‘God’s word written’, the Bible. Of course, this is not itself an easy process. It is not easy, for example, to find out what the Bible says about a new Bishopric Endowment Ordinance. But we are anchored in God’s revelation, and so we must listen carefully, especially to those from a different background from our own, as we seek together to understand and act in line with God’s will. Of course, it is possible at the end of the discussion that we will still not all agree with each other. Jesus commands us to love another, as he loved us. Love is not happy in evil, but is happy in the truth (as Paul says in 1 Corinthians 13:6), which means that loving others does not simply mean agreeing to differ. But love trusts, hopes, and perseveres, rather than giving up on others. I hope that at the end of this synod, we will still be committed to obeying Jesus’ command to love one another. We have before us a number of proposals for legislation. They have been sent around in the synod papers, with some attempts at explaining what they are about. I do not want to repeat what was said there. But I do want to emphasise that most of our legislative business centres on improving what we call the safety of our churches – in other words, doing all we can to make sure that nobody is harmed, particularly those who are most vulnerable, including children. The Royal Commission into Institutional Responses to Child Sexual Abuse has continued since the time of our last synod, and will conclude later this year. The wrap-up hearing into the Anglican Church occurred only a few weeks ago. The evidence that has come to the Royal Commission reminds us that we cannot be complacent, but must keep putting effort into our systems. Good systems do not guarantee that all will be well always, but they improve our accountability and they improve our attention to this important matter. The Royal Commission has indicated that it finds the lack of a national approach to Safe Ministry in Anglican churches inadequate. The Anglican General Synod laid the first steps towards a national approach in 2004, but since that time, weaknesses in the model have been discovered. Different dioceses have responded to these weaknesses in different ways, with the result that there is a lack of consistency now across dioceses. 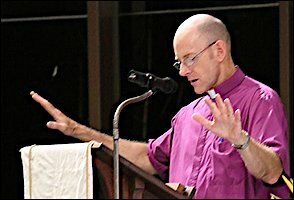 The General Synod’s Professional Standards Commission (under the new name of the Safe Ministry Commission) continues to research and present new policies and protocols that it recommends for adoption across Australia, and so for the next few years, there are likely to be more changes and improvements made. In our diocese, we have been working with a company called Safe Ministry Resources, which has helped us to recognise our needs for change, and suggested proposals for how to do this, including some of what is coming to us in synod. Although we will have to change more in the future, I believe we must act now to fix what we know is broken, rather than putting up with the weaknesses until a national or provincial better plan is provided. The way that synod actually runs from minute to minute rests on Standing Orders. Another way of describing Standing Orders would be to say they are the rules for the way we do things. They are the default settings for our processes. One of the Standing Orders (No. 18) is that we can vote to ‘suspend’ Standing Orders, in other words, for a while we can do things a different way. The Standing Orders have been there for a long time, and we should not suspend them lightly or too frequently. However, for a number of reasons, the synod may be asked to suspend them at various points of our deliberation, and we should take these requests seriously. In particular, I believe it would be helpful to change the order that we deal with some of the matters in front of us. Similarly, for reasons explained in the explanatory memoranda about the Professional Standards Ordinance, we were not able to meet the deadline for the draft legislation to be in, and to deal with it Standing Orders concerning how legislation should be introduced would need to be suspended. Last synod, I mentioned six planks that I felt needed to guide what I, and we together, focused on in the diocese, and I have written more about them in the issues of Top Centre since last synod. Now that I have been the bishop for nearly two and half years, I have had more time to think about and refine the areas that I believe need attention and resourcing. For that reason, I am hoping synod will discuss (and even endorse) the strategic plan that I am bringing forward. I am very aware of the dangers of the bishop presenting a strategic plan. In a recent book about Sydney Diocese, the author comments on Archbishop Robinson’s Vision for Growth plan which started in 1983. Ballantine-Jones writes, “The problem for VFG was that it had minimal parish, synod or Standing Committee involvement. In my view one reason for that was that Robinson saw himself and his bishops as having the pivotal role [rather than Synod, Standing Committee or grassroots elements].” Nevertheless, I have repeatedly been asked over the last two years (and longer) what my strategic plan is, and so I hope there is some value in sharing with you what I see as important for the next few years and hope that you will engage with it, modify it and in the end own it. I acknowledge that the formulation of the plan has been a top-down process rather than bottom-up, but it has had various levels of consultation and change before arriving at synod. You already have in your synod papers my comments on the plan, but I emphasise that it is strategic because it draws attention to what things will need more effort and focus than others to become the best levers for growth. We cannot do everything and so the strategic plan proposes what we should make our priorities. I emphasise also that it is a diocesan strategic plan, which may have implications for the churches of the diocese, but is not the same as a parish strategic plan. The relationship between parishes and the diocese is not always easy to define. Perhaps one way of describing it is that the diocese can encourage local ministries by giving people a sense of belonging to something wider, as we share together in the work of God in the Territory; it can provide central services such as insurance and safe ministry resources; it can provide a more sustainable link with the churches and other agencies outside the Territory, and it can resource or co-ordinate ministries that are beyond the capacity of the single parish to undertake (which is the way Anglicare developed, as well as Kormilda College and Nungalinya College in co-operation with the Uniting Church Northern Synod). However, if synod endorses the plan, I hope it will have implications for the parishes. I hope it will circulate enough in our diocese that every parishioner will be able to state that ‘We are God’s workers to grow churches that celebrate, talk about and demonstrate the saving work of Jesus Christ in the communities around us.’ Each element of this statement is important. We are engaged in the work of God, not our own business. This gives us a high level of privilege and also of responsibility. We can trust God to do his work, and at the same time, he chooses to work through us. God’s business is growing his church, in his own time, both numerically as we see so clearly in the Acts of the Apostles and then in subsequent history, but also in the maturity of congregations and individual Christians as they grow in their knowledge and love of God and his Son Jesus, as they resist evil and do good, becoming as resilient and fresh as trees growing along rivers. Our worshipping congregations are places where we celebrate God’s saving work in Jesus, which means that every church service is something like a party, full of joy and gratitude to God. God calls his people to not just celebrate in holy huddles, but to reach out with the good news of Jesus. This will involve words because that is how stories are communicated. But it will also involve actions, because God’s people are to have lives of integrity where words and actions match. Sometimes people in our communities have heard so many words that our actions will have more impact. On the other hand, there are many people who have not heard the word of the gospel, and actions on their own will not communicate that story clearly. At the heart of what we celebrate, talk about and demonstrate is the saving work of Jesus Christ. There are all kinds of religious ideas in the world, but what we believe is that ‘for us and for our salvation, he came down from heaven, was incarnate of the Holy Spirit and the virgin Mary, and became truly human.’ ‘For our sake, he was crucified under Pontius Pilate.’ ‘On the third day, he rose again, in accordance with the Scriptures.’ ‘He will come again to judge the living and the dead and his kingdom will have no end.’ The communities around us contain many people who, like us, need rescuing, and God commissions us to be part of his rescuing work. The strategic plan presents only three objectives: focusing on our churches, our cross-cultural relationships in the diocese, and our partnerships inside and outside. If synod endorses this strategic plan, there will be further steps to take in implementing it. It might be helpful to have a group, separate from Diocesan Council, that can take the strategic objectives and turn them into operational plans so that we can map out a concrete way forward and monitor our progress over the next few years. I would like to say a little about the three strategic objectives. The first is that all of our churches be growing and celebrating communities. I want to highlight again that I believe God’s purpose is to grow churches in numbers and depth. About a year ago, our average attendance at Anglican churches in the Territory was about one quarter of one percent of the Territory population. This has increased in the last year, but we still have a way to go before we can be comfortable with the size of our churches – if we can ever be comfortable! The key ways that I believe that ongoing growth is likely to happen is by encouraging evangelism, encouraging church leaders, having attractive church services, and attempting to start new ministries. The second strategic objective recognises the special significance of Aboriginal churches in the Diocese of the Northern Territory. About six years ago, the Lutheran Church of Norway published a report about their own indigenous churches (among the Sami people). The concept they used to talk about the interlinking of two cultures was one of inclusion rather than integration or homogeneity. What they meant was that the church expresses best what God is doing when there is a recognition that indigenous minorities are equal with the majority culture. This will be marked by excellent two-way communication, where both cultures can hear the other, and where there is no expectation that everybody will blend in together. In the Norwegian report, the church declared that it would only truly be the Church of Norway when the Sami voice was heard. The same could be said of our diocese. For this to happen, we must continue to support our indigenous churches, particularly in language and leadership resources, as well as explicitly valuing their perspective and contribution to the whole. The third objective relates to our need for partnerships outside the diocese to support our ministries, as well as recognising the partnerships that we have within the diocese. A first step in growing partnerships is to make sure our own organisational structures are working well and inspire confidence in outsiders. Fortunately, I believe that on the whole, our partners have a good degree of confidence in what we are doing, so we have a strong foundation to build from. There is ongoing interest from various entities, particularly parishes in different parts of Australia, to have connections with us. We are working on having policies in place to shape these interests so that they will be productive in ministry here. It is appropriate to recognise with gratitude the many partnerships we have between the diocese and other agencies and parishes. A major mission partners consultation was held almost exactly a year ago that brought together key leaders from many of the organisations that we are working with. These leaders sent the clear message that it would be helpful for them to have regular consultations like this, so that they can stay up-to-date with what is happening in the Territory, and so that they can work in collaborative ways rather than stepping on one another’s toes. Our major partners include Church Missionary Society, Bush Church Aid Society, Sydney Diocese, National Home Mission Fund (until its hibernation in 2016), Anglican Board of Mission, Anglican Deaconess Ministries, Society of the Sacred Mission and MU Australia. We also have significant involvement with AuSIL, Scripture Union and Bible Society. There are also a number of parishes around Australia that contribute, have contributed, or are looking to contribute, in various ways to ministry in the diocese, including St John’s, Gordon, St James’, King Street, St Clement’s, Mosman, Bobbin Head Anglican Church (all from Sydney), and St Mark’s Forest Hill, St Jude’s, Carlton, and St Columb’s, Hawthorn (in Melbourne). One way that our partnerships have been promoted and developed is through my accepting speaking engagements and other roles with our partners. These have included speaking at CMS summer conferences in January 2016 in five states and at CMS SA/NT summer conference 2017, BCA Federal Council in 2015, BCA Victoria spring lunches in 2016, BCA NSW conference in August 2017. There is also other engagement with entities that are not partners, but which provides the opportunity of sharing the story of ministry in the Territory and seeking recruits to join us. This has included presenting seminars at the National Training Event of the Australian Fellowship of Evangelical Students in December 2016, and the Sydney University Evangelical Union Annual Conference in July 2017. There have been other engagements with smaller entities, such as preaching at St John’s Gordon, speaking at the Willochra Diocesan mission conference in June 2017, and the Figtree Anglican world mission conference in August 2017. At this synod we are receiving reports from committees that were established by last synod on some significant matters within our common life. One of these was on the question of wine at communion, another addressed climate change through reducing carbon emissions. If we make changes in these areas, it will largely be because our communities’ expectations have changed, and this has led us to review our own ministries and suggest new ways forward. It is important for us to continue to review the way our ministries are conducted, so that their impact is positive rather than negative. A similar matter, around adjusting to changing community expectations and perceptions, is not being addressed by synod, but I will address it here. This is the issue of what clergy wear at church. The practice of the diocese for many years is that all ministers wear white albs (or cassalbs) and coloured stoles when conducting services. I understand that in recent years, what was insisted on as an absolute minimum, although perhaps without being documented as a requirement, was the wearing of the stole when conducting the services of baptism or Holy Communion. I raised the issue of clergy dress by email to clergy, and then at the clergy conference, last year. The principles that I believe derive from our Anglican foundations and current rules are that distinctive appearance is appropriate for those in ministry, but that there is no doctrinal significance attached to any particular garment. The law underneath this matter in the Diocese of the Northern Territory is the Canon concerning Vesture of Ministers of the 1992 General Synod, which our diocese adopted in 1993. Under this law, if the synod has not specified what the requirements are for clergy dress, the bishop may declare what standards are in force. In my consultation with the clergy, there seemed little appetite for bringing this matter to synod. An experimental shirt design has been trialled by a number of clergy, and has received positive feedback. Therefore, until synod chooses to express a further instruction, I am announcing that a white shirt, whether polo-style or buttoned, with the diocesan crest permanently affixed to it (such as by embroidery), is sufficient as clerical vesture for church services. This does not rule out the traditions that are in place in a number of parishes, but adds to the options that are available for clergy. While I believe that people who are not church members are quite tolerant of what we insiders do, I believe that to modernise clergy dress will perhaps reduce the degree to which we seem rather quaint in a way that is not necessary biblically or doctrinally. At the same time, I would expect clergy to be respectful of the expectations of their own congregations, as well as the expectations of those who might attend as visitors for baptisms, weddings and funerals, and to discuss this matter with them for local decision-making. A cultural matter of a different kind concerns our communications systems in the diocese. One step forward has been the upgrading of Top Centre as the quarterly diocesan magazine, and I am grateful to Jai Chandler for her work on this, as well as to those who have contributed articles from time to time. Tavis Beer has convened a working group to develop better practice from the diocesan office in terms of other communication strategies, including Facebook, Twitter, and the diocesan website. In many ways we are just at the beginning, but as the world’s ways of communicating develop around us, we must find ways of joining in. Ministry units are the first level of recognised Anglican presence. To be declared a ministry unit, an area or community would need to have at least 10 people regularly attending public worship, and some capacity for leadership within that number. Communities with a population of less than 300 people should be considered as ministry units rather than parishes unless they regularly have more than 30 people regularly attending public worship over a twelve-month period. Ministry units are entitled to send two representatives to synod but only one voting representative, and are asked to make a contribution of $200 as a diocesan assessment. If a church does not meet these benchmarks, it should be considered as part of a larger parish unit. For consideration as a new parish, an area should have a population greater than 300 people, and have a regular worshipping community (that is, people on a church roll) of 50 people. Diocesan assessments would be contributed according to the formula that DC has agreed to. For some years, Milyakburra, Urapunga and Kewulyi have been treated as ministry units, although Diocesan Council has never actually decreed them as ministry units. These centres send people to synod, and report to synod on what is happening in their area. Now that there is a policy in place that sets out what would constitute a ministry area, I hope that these three centres will be able meet those requirements. I want to make clear that the criteria for parishes and ministry units are for the development of new ministries, not a mechanism of ‘downgrading’ an area from a parish to a ministry unit. This way of recognising smaller ministries might also point the way forward if churches are considering planting new congregations in other centres, with a view to them moving eventually towards independence. Since last synod, we have had a number of welcomes and farewells among diocesan staff, appointees and clergy. In other roles, Mr Mark Fowler has been appointed as Deputy Chancellor. Greg Buxton, Janie Mason, Jane Aagard and Olga Havnen have resigned from the Anglicare NT Board, and Sally Yule and Clarissa Comerford have been appointed to the Anglicare NT Board. Chris Nathanael and Catherine Weber resigned from the diocesan Property and Finance Committee and Greg Buxton and Keith Stephens were appointed to it. We can be very grateful to all these people for their commitment and contribution to ministry in the Territory. Other major events in the diocese have included the 70th anniversary of the opening of St Mary’s Children’s Home in Alice Springs, in July 2016, which was attended by the Primate as well as many former residents, and the hosting of the National Anglicare Conference in Darwin in September 2016. There is much to thank God for in the work of the Diocese of the Northern Territory. As we move into the business of synod, let us continue to ask God to give us hearts and minds that are united in our shared identity as the rescued people of God and our shared purpose of worshipping him and lifting up the name of Jesus.